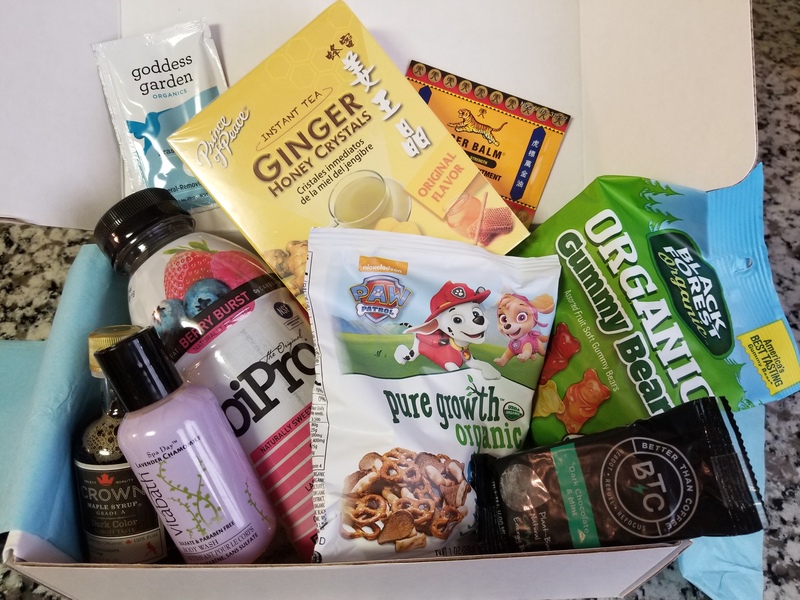 June’s box had a nice variety which included snacks, maple syrup, a body wash and a caffeine energy bar. Keep reading for a close look at each one. You had me at coffee! This plant-based energy bar says it delivers a caffeine kick, better than coffee- I must admit, they are not lying. I got a dark chocolate and mint bar, with the first bite the mint hits you, then you get the coffee flavor, mixed with the chocolate. The bar was good, nice texture, not grainy; and even though you taste the caffeine, it doesn’t feel like you are munching on straight coffee beans. You feel very energized afterwards, and I didn’t feel a crash. The name is fit for the bar, however I still enjoy the ritual of sipping on a cup of coffee. Don’t get me wrong, BTC bars are a good alternative to coffee when you are on the go. Nice to stash them in your office or purse when you are low in energy, without any jitters or crash when the caffeine runs its course. I love the fact these energy bars also give you 5g of protein and 4g of fiber, and the protein is derived from peas. Check out all BTC energy bars here. Cute packaging for kids, with ingredients that make them a guilt-free snack. Tasted like a less salty version of Chex mix. Both my kids liked them, and the bag was empty after snack time  Satisfied kids after a healthier alternative to chips or trail mix, makes for a happy mommy. Try some out for your little ones here. Second product I’ve used from Goddess Garden, and they have not disappointed! Used this whole packet up in about a week. Worked great to remove and cleanse my face at night, and saw no unwanted side effects on my skin. It’s a greyish, clay-like liquid with not much of a fragrance. Loved the lightness of it, and how fresh my face felt afterwards. Definitely recommend this. Try Goddess Garden mineral removing cleanser for yourself here, or check out some of their other amazing products. My husband tried this one out for me, since I am not a fan of maple syrups. He is very picky about which syrup to use, so he was the perfect candidate to try this one out. Happy to say, he liked Crown maple syrup, very much. Said it’s one of the best he’s tasted, and he wished the sample was bigger lol. Guess that means we gotta put in an order, find more syrup varieties by Crown Maple here! Summer season also brings mosquitoes along, and if you’ve ever been bitten I’m sure you’ve experienced the pain after over-scratching. This Tiger Balm ointment came in handy both to help stop the itch from a few mosquitoe bites, and soothe the slight pain. Nice little packet made it easy to squeeze out a small amount, fold it up and save more for next time. I like that Tiger Balm has that minty/floral scent that it’s known for, but they are branching out into different products to deliver that soothing comfort when it’s needed. Grab some Tiger Balm pain relieving ointment, and check out their other products here. My previous Goodie Box had some chewy ginger candy by Prince of Peace that I really enjoyed, so I was pretty sure this tea wouldn’t disappoint. It’s a nice alternative to your standard tea bag; you pour out the ginger honey crystals, add hot water and voilÃ ! The tea tasted very much like the chewy ginger candy, a little bit sweeter, but you still get that zing from the ginger. Very nice tasting tea, even better that it’s made of ginger since it has great health benefits. Prince of Peace truly knows how to make great tasting products utilizing ginger root. Check out more Prince of Peace products here. BiPro protein water is naturally sweetened and contains whey protein to help your muscles grow and recover post workout. Each bottle is 90 calories and contains a whooping 20g of protein. It is recommended to be taken 30 minutes before or after your workout, right before bed or upon waking up for best results. I took mine 30 minutes post workout to help with muscle recovery, and it was a nice and fruity treat. Doesn’t leave you feeling thirsty for water like some drinks do, and it’s got a nice berry flavor to it, without an artificial or over-sweet taste. It has five ingredients which is nice to see on something that’s supposed to be helping you, and zero carbs and sugars. Good drink to cut your sweet cravings, get a good source of protein and not feel guilty about drinking your calories. Try BiPro for yourself here. These gummy bears were so sweet and soft to chew. They tasted very juicy, and have got to be the best tasting gummy bears I’ve had, hands down. I liked them so much, I went out and bought a pack of their organic gummy worms the next day Those were good too, but the gummy bears were much better. Grab some here! VitaBath lavender and chamomile body wash is sulfate and paraben free, and it doesn’t lack any good stuff. The scent smells so delicious, almost like a juicy gummy bear. The lavender and chamomile hints are both there, they are strong but not in a bad way. Leaves your skin feeling soft and clean. Massage on the soles of your feet for a nice, soothing feeling on tired feet. I normally prefer a body scrub, but this body wash might have changed my mind. A must try! Find it, and more products by VitaBath here.